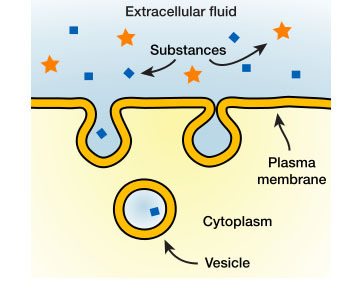 Blood-brain barrier: a protective layer that surrounds the brain and controls what things can move into the area around the brain. Nanoparticle: a very tiny object, often thought of as a small piece of matter measured on the nano-scale (between 1 and 100 billionths of a meter long). Target cell: a cell type that doctors want to treat or that an antibody is designed to attach to. Travel can be done on a much smaller scale than it is in airplanes, trains, and cars. Image by Fastily (Talk). 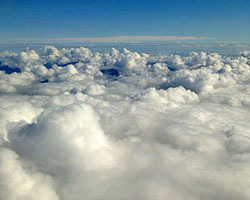 From your window seat on the plane, you watch huge clouds rise up like fluffy mountains around you. Or perhaps you can see the landscape rush past you as you ride a speeding train. Whether you’ve travelled in these huge vehicles, or you’re more used to riding in a car to school, you have experienced the ways people get things where they need to go. Much like how we use cars, planes, and trains to move things to different parts of the world, scientists can make tiny vehicles that travel inside the body. These tiny vehicles are very small bits of matter called nanoparticles. Scientists are finding ways to build these nanoparticles so they can carry medicine and deliver it to very specific parts of the body. Why Do Scientists Need Nanoparticles? Right now, a lot of diseases can be hard to treat with medicine that you eat or drink. For some, like diabetes and brain disease, this is because there is a barrier blocking the medicine from going to the right places. Insulin can't be absorbed through the walls of our digestive system, so diabetics need to inject it into their muscles. Illustration by BruceBlausen. In diabetes, the walls of the digestive system are a barrier. Diabetics need insulin, which can’t be absorbed in the intestines like most food so it just passes through the body. 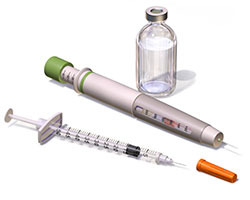 Insulin needs to be injected into the body instead of digested. The brain can also be problematic to treat with medicine. Humans have a Blood-Brain Barrier that keeps things from getting into the brain from the blood stream. To get around this, sometimes doctors can inject medicine into the fluid that surrounds the brain. Even if the medicine can reach the cause of the problem, it doesn't always work. This happens when treating many types of cancer. The cancer cells hurting the body can seem very similar to normal cells, so even if a patient gets medicine to the right area of the body, it may kill normal cells along with the cancer cells. This can cause patients to lose their hair and feel sick. Cancer forms by altering normal cells, so cancer cells can seem very similar to normal cells. It can be tough for medicine to act on cancer cells without hurting normal cells. Click to enlarge. Another problem is that sometimes the body protects itself too well. When medicine enters the body, the immune system may see it as a threat and eat it up before it can do its job. All of these problems can be solved by packing medicine into nanoparticle vehicles before giving it to patients. Nanoparticles can deliver medicine to the right spot, passing through barriers like the blood brain barrier or digestive system walls. They can also protect the medicine they carry from the immune system. How Do Nanoparticles Get to the Right Spot in the Body? Where a nanoparticle goes depends on its size and what sensors are on its surface. These properties can be modified to make them target different areas or diseases. How do nanoparticles get inside of cells to release their medicine? Click to find out. Nanoparticle size controls their ability to move through the body. Smaller nanoparticles move through the body without getting stuck in tight spaces. They also are easier for cells to swallow, which is important because nanoparticles need to release their medicine inside cells to work. Smaller nanoparticles can also let go of medicine faster. It might seem like a good idea to make the smallest nanoparticles possible, but there is a size limit that can’t be crossed. If the nanoparticles are too small, they will clump together. Clumpy nanoparticles are no longer small enough to work properly. That’s why it’s important to stay within a certain size range when designing nanoparticles. While their small size allows nanoparticles to go anywhere in the body, they still have to find their target organs or cell types. Scientists can program nanoparticles to find cell types from different organs, systems, or even tumors because each type of cell has different proteins on its surface. This is the cell’s way of announcing which tissue it belongs to. Even cancer cells have their own set of proteins that they display. 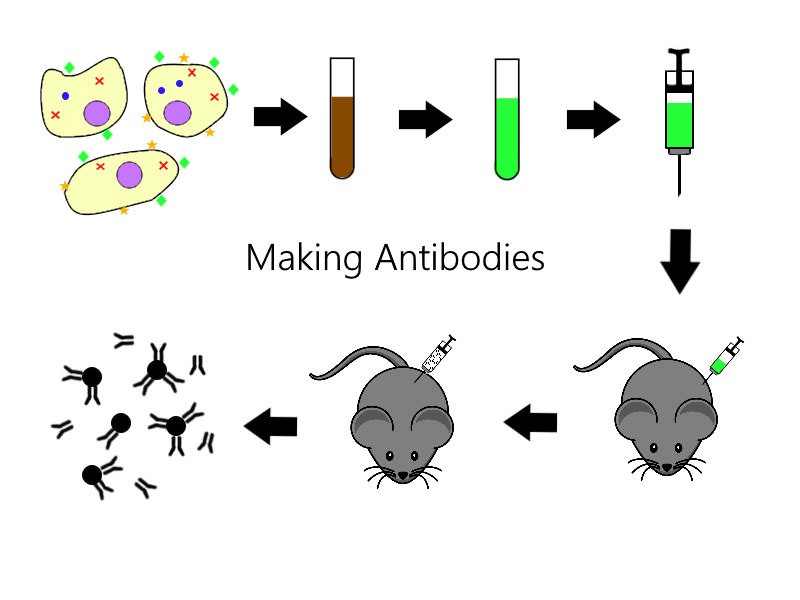 Antibodies must be attached to the nanoparticles so they will attach to specific target cells. Click for more detail. Nanoparticles have sensors, called antibodies, on their surface that can attach to specific displayed proteins. When a nanoparticle is attached to a cell, the cell will often eat it. So what do you think would happen if a medicine-filled nanoparticle attached to a cell? The cell would eat it, along with the medicine inside it. This means that scientists just have to make nanoparticles stick to the right cells. 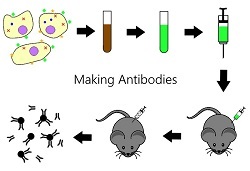 To do this, they can add antibodies specific to the target cell type’s surface proteins to the nanoparticles, causing them to attach to those target cells. There are a few other tricks to getting nanoparticles to the right spots that depend on the tissue being targeted. If nanoparticles are given an electric charge, they will be attracted to certain tissues like the lungs. Or the nanoparticles can be made out of fatty molecules that are naturally delivered to the liver. There are even some nanoparticles made out of substances that attach to bone molecules. 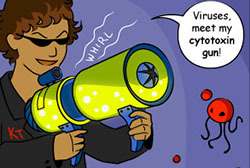 Learn more about the immune system with our comic book Viral Attack. It’s the immune system's job to keep you safe from invading organisms, like bad types of bacteria, which can harm you. Immune cells move around in your blood stream looking for things that aren’t normally there. When they find something foreign to your body, they eat it and take it apart. They do this by recognizing molecules and structures that are normally on cells and other materials in the body, and attacking anything they don’t recognize. On their own, many medicines would be eaten by immune cells because they are not normally made in a human body. To get around this problem, scientists put the medicine in nanoparticles that are either made of or covered by molecules that are common in living things. These nanoparticles can trick the immune system into thinking they are part of the body even though they came from outside it.